This week's Bad For You: Mountain Dew Pitch Black, left, and Mountain Dew Black Label. I would rather they ask me what’s the worst food I’ve ever had, which was a can of Mountain Dew that my Uncle Dave had been using as an ashtray. I was very young at the time and thirsty and I obviously did not know that I would be getting a mouthful of citrusy-cigarette butts when I took a giant gulp. I’ll never forget the taste burning my throat. I was coughing up ash all over our basement. I enjoyed Mountain Dew as a kid, but after this harrowing incident, it put me off the stuff for good. Just as Bad For You made me face my fears of eating Cheetos (albeit ones filled with a macaroni-ish substance), this week I’ll be reviewing two newer flavors of the Dew: Pitch Black and Mountain Dew Black Label. Mountain Dew Black Label. Despite both drinks having the word 'Black' in them, it's clear that neither is actually black. As a baseline taste for the others, I bought a can of original Mountain Dew. After opening, I double-checked to see if there were any cigarette ashes. After drinking, I believe there was no more than the usual amount. Mountain Dew is very sweet and syrupy, with the citrus flavors mostly coming in the aftertaste. I prefer the lighter-tasting lemon-lime-ness of Sprite, while this is more of a blend of flavorings. The Dew also has slightly more caffeine than the average soda, which has helped to make it a favorite for younger people – what with the video games and the skateboards and all. Over the years, there have been dozens of limited-time flavors or variations of Mountain Dew, so many that they occasionally put it up to the public to vote on which flavor should become permanent. 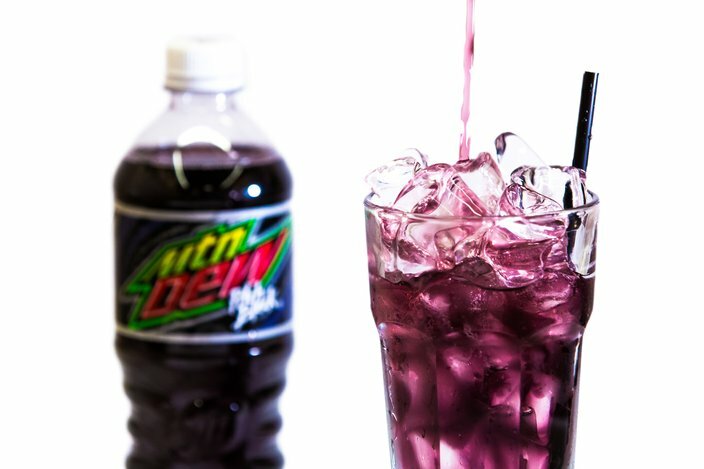 As part of what the company called DEWcision2016, the two flavors of Pitch Black and Baja Blast were pitted head-to-head. In a very tight race, Pitch Black triumphed over Baja Blast, sending the latter back to being a Taco Bell-exclusive. Pitch Black tastes like you took 60% cheap grape soda and mixed it with 40% Mountain Dew, with some more caffeine and corn syrup for good measure. It sort of tastes like a melted grape popsicle. I enjoyed the drink more during the first few sips but its super sugary taste is way too much after a while. There’s also a slightly bitter aftertaste I could do without. Mountain Dew Pitch Black. It smells like melted grape Jolly Rancher's..
It’s a soda. Soda is not classy or fancy in any way. I’m not putting on pants to drink a soda or even to go buy one. I’m not entirely sure to whom this is being marketed. The only demographic I can think of are rich children who want to pretend they’re fancy drunks like their parents. Regardless, Mountain Dew Black Label has a similar array of flavors to Pitch Black, but not as intensely sweet. 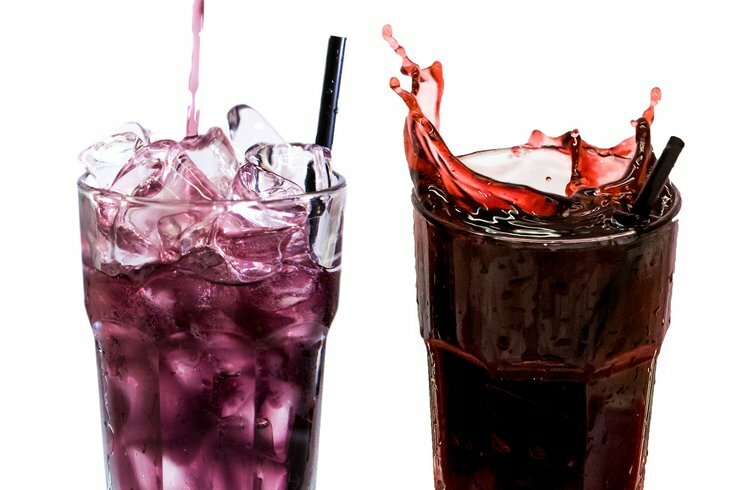 There are more hints of orange soda – even fruit punch – which actually cuts down on the sugar overload, at least taste-wise. You do also get a taste of “herbal bitters,” similar to that weird tangy fizziness in an energy drink. (Despite the taste and the look of the can, it is not an energy drink.) Unlike Pitch Black, I could probably enjoy a whole glass of this. 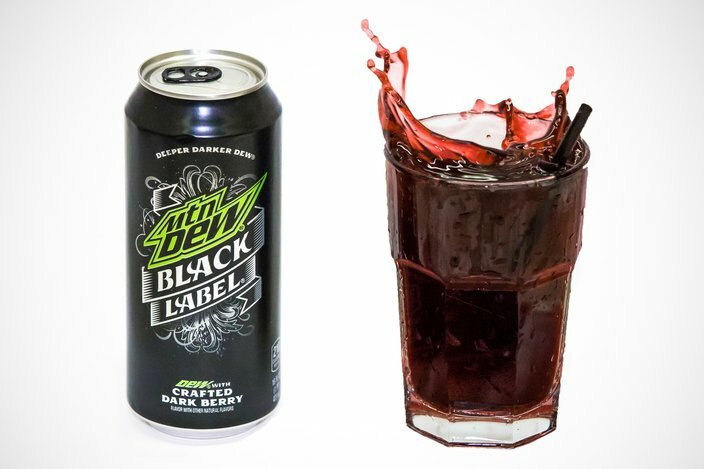 Black Label does move away from the taste of original Dew so much that it’s basically a new drink. Dew-heads be warned. Verdict: Pitch Black is too dang syrupy, though Mountain Dew Black Label is an OK soda.